PLEASE VISIT US ON FACEBOOK AT BETTS QUARTER HORSES AS MANY PHOTOS AND VIDEOS GET POSTED THERE! We currently have only one 2yr old prospect left and she’s in for training, got behind this year so we will actually have a 3yr old for sale! Then it’s on to the next crop of 2yr olds in Feb/March with a very nice selection of color, size and talent! So for the first time in years, due to workload, we are offering some fillies “unstarted” for those “do it your selfers” out there! The last couple years there’s been a lot of requests for unstarted prospects so here’s your chance folks! Yes, they are fillies, but they ARE NOT the bottom end, in fact, probably the opposite, but as you know, the geldings seem to go first, so at this time, they will all stay here to be started. Welcome to the "pretty buckskin" ranch! The 2017 foal crop has a ton of color! 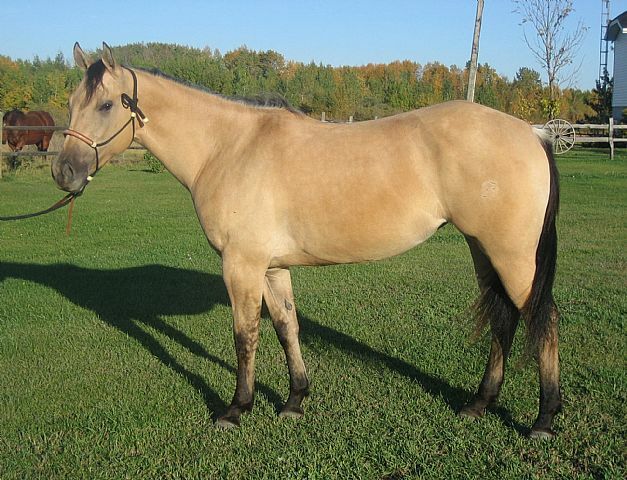 If you're looking for a buckskin, and a pretty one, this is the place to look! The 2018 foal crop has some awesome prospects! Looking forward to another successful breeding and training season! This is a living for us, not a hobby and we are proud of our program, training and breeding, and we have not cut corners in either with these nice prospects. They are exactly as presented and they are sold with confidence behind them. They have a very solid foundation and are ready to go in any direction. We do the work and take the time to "take the time". We feel the prices are very reasonable, considering the breeding and solid training involved. 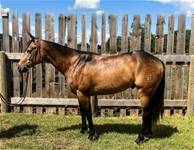 We have a very good training program and could provide potential buyers with numerous references as to the quality of product you will get from BETTS QUARTER HORSES. We now have several colts that have gone on to professional training programs and become money earners. We get a lot of positive feedback from our training clients about the kind of program Ken has for starting colts. His program instills confidence and respect which increases a colt's learning curve tremendously. They become willing, trainable individuals. Most are ready for any discipline at the end of the program. The horse itself becomes it's only limitation. All horses sold are subject to 5% GST. Vet inspections welcome but are done at prospective buyers expense. UPDATE DECEMBER 2018 - “Gina” is in the barn, training started. This filly has always been on the smaller side so she was left till last. Ultimately should mature about 14.2-3 but she has turned out to be quite stout. 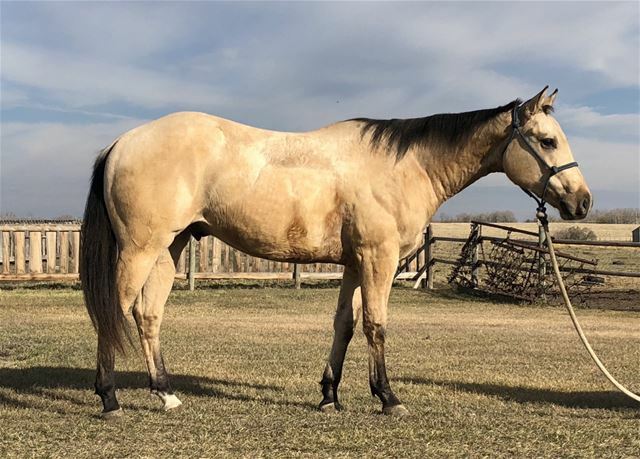 This filly is a unique buckskin color, has a ton of personality, and super quiet. 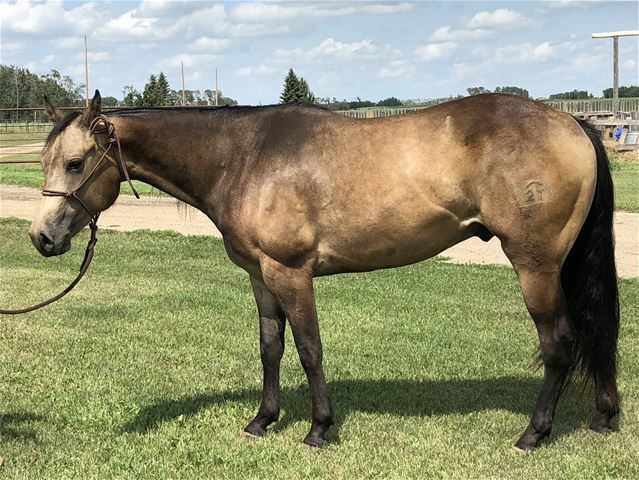 This is the last of our MR AMARILLO CHEX offspring and her full and half siblings are sure making a name for themselves in performance homes, plus they are smart, reliable, trainable and talented. Will update pics shortly as she sure doesn’t look like this anymore! She’s built just like her dad! 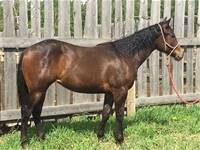 PRODUCER OF BUENO CHEX IMP, 1986 WORLD CHAMPION WORKING COWHORSE, AQHA WORLD CHAMPION SENIOR WORKING COWHORSE, AQHA WORLD SHOW 3RD PLACE SENIOR REINING, SUPERIOR REINING, SUPERIOR WORKING COWHORSE, MANY OTHER ACCOMPLISHMENTS. UPDATE DECEMBER 2018 - price is for un-started get her now while at the lowest price, as it will increase if she goes into training here! CEECEE” is out an own daughter of PEPINICS MASTER. The foals out of this mare are talented, quick, smart and correct. This filly is quieter than others, quite stout and people friendly. “RONNIE” is a nice, big, strong filly. Should mature like her brother and make a real nice ranch/rope horse prospect. She’s a real nice dark bay/brown that is real pretty in the summer. 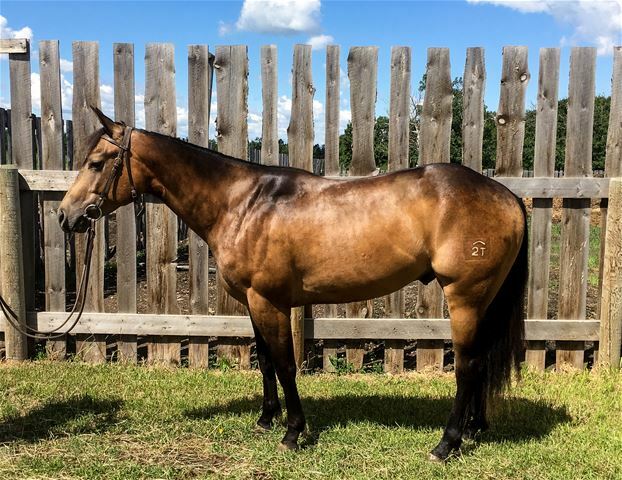 UPDATE DECEMBER 2018 - “TEN” is only for sale due to workload, we’re offering a few fillies for sale this year, in no way are they considered the bottom end. Lots to be excited about with this filly! ”TEN” is a beautiful buckskin filly, full sister in TJ Milne’s roping program. UPDATE DECEMBER 2018 - ”CINDY” is a super cute filly, bay with a lot of flash! Only for sale due to workload. This is one of the best from this crop guys! 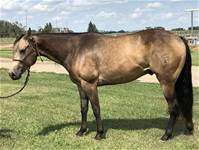 This filly has several full and half siblings in high ranking performance programs. They are athletic, talented and easy on the eyes! UPDATE DECEMBER 2018 - for sale only due to workload, this is so far the best foal this mare has produced and if you look at her full brother that means she’s pretty darn nice. Perlino isn’t our favourite color, and we rolled the dice there, but you have to give credit where credits due, this a very well put together filly. 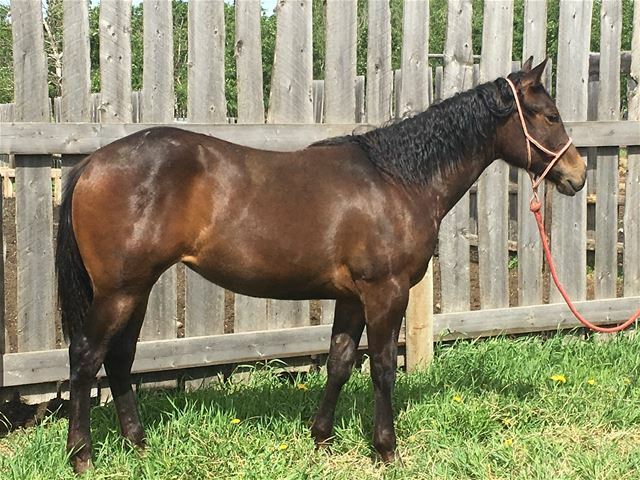 By NFQHA standards this one hell of a well bred filly, and a 100% color producer to boot! ”LEMON” is a gorgeous, well built foundation bred perlino filly! Both sire and dam proven. SOLD! Thank you Running Bar Ranch, Cochrane, AB! SOLD into another good Roping program, watch for her at Futurities in a couple years, thank you Kody! Watch for “Hooey” at future events! “ROMEO” Full brother is part of the Bonnet roping program, full sister in a ranch/rope program.